Vertical Twin or any bike that vibrates too much – an easy fix ! Some vertical twins vibrate a lot. My CM400 was smooth at 55 mph, but starting about 60 mph you would get more vibrations through the handlebars. On my 1.5 hour commute, the vibration would put my right hand to sleep. When I took off the stock bars and put on lower ones, it got worse – the aftermarket bars were thinner/lighter. Changing grips did not help much. Adding weights to the bars helped some. I bought this bike in 2009 and I can’t believe I did not think of this until now. I just used an old motorcycle inner tube – fold it to make two layers. In order, here is what goes on each side of the two upper bolts of the upper engine mount: thin metal washer, rubber (two layers), bracket, rubber (two layers). If the rubber or washers are too thick, the bolt will be too short. 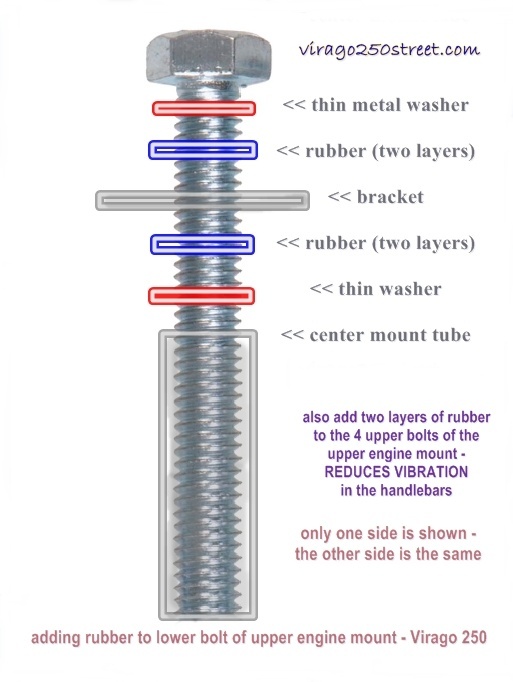 In order, here is what goes on each side of the lower bolt of the upper engine mount: thin metal washer, rubber (two layers), bracket,rubber (two layers), thin washer. The last thin washer is very important as it goes against the center mount tube. The center tube mounting tube is very thin, so the contact point with the rubber would not be enough – a thin metal washer is required. If the rubber or washers are too thick, the bolt will be too short. The stock bolt is about 4.25 inches long, if you buy a bolt about 6 inches long, you can use four layers of rubber instead of two. I am going to try this next. I used a 3/8 inch x 6 inch long bolt. It was 7/8″ longer than needed, which leaves room if I want to add more rubber pieces. A 3/8 x 5 inch bolt would work, if you use thin washers. I added more rubber pieces so now the lower bolt has four layers of rubber. A good size for the rubber pieces is 1 to 1.5 inches diameter – round. Make a hole that will easily slip over the 3/8″ bolt. The metal washers should be 1 inch or slightly bigger. A perfect choice would be 1.25 inch round rubber pieces and 1.25 inch metal washers. Do not over tighten the lower bolt – lightly snug is good – use two nuts on the lower bolt. choice 1).. The best choice is probably Sorbothane vibration absorbing material. (Thanks to Mike Johnson for the info – I never heard of it before.) I will probably try some later, but if you know me, I have to wait because of the cost. I found a 12 pack of one inch OD/.45 inch ID Sorbothane discs for $16.95 – I think shipping was extra. choice 2).. A good second choice is a dense, hard rubber. choice 3).. Motorcycle inner tube is a good third choice. Bicycle inner tubes are thin but maybe OK if you use four or more layers. If you can find used semi truck tubes, they are great. choice 4).. An old mouse pad or diving suit (thanks David Thomas) will work fine, but in maybe six months it could become compressed and will be less effective at reducing vibration. You can buy rubber discs at Home Depot and Lowes, but it is easy to make them yourself. The key thing is to make a good center hole. Use a single hole punch, the kind you would use to punch holes in paper. If you do not have a single hole punch, you can make a punch out of something hollow and about 8 mm in diameter, and sharpen the outside edge. Place the punch over the rubber and hit it with a hammer. If you did not cut it all the way around, just hold the punch at a slight angle so you can focus the hammer impact on the part that needs to be cut. After the center hole has been punched, just use scissors the make the outside edge of the rubber washer. The first one you make will probably look pretty good, and the ones you make after that will be looking almost like you bought them. Make a bunch up in advance – so you will have them when you need them.